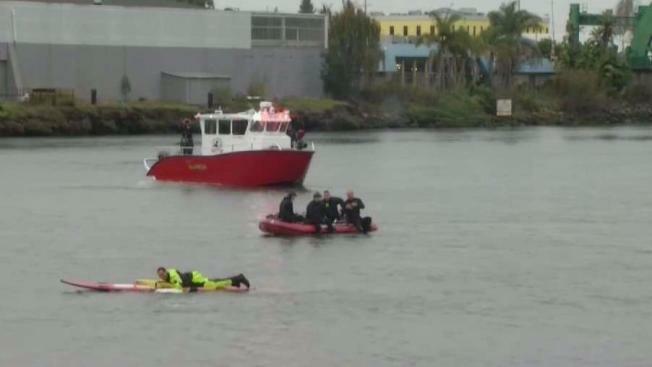 A man died Sunday after the vehicle he was in plunged into an estuary between Oakland and Alameda, according to officials. After finding the man roughly two hours after his vehicle crashed into the water, emergency responders tried to resuscitate him before transporting him to the hospital, according to Oakland Fire Department Battalion Chief Nick Luby. Oakland police later confirmed that the man had died. The Alameda County Coroner on Sunday night identified the victim as 68-year-old Paul Sherer of Alameda. Witnesses reported around 8:20 a.m. that a vehicle plunged into the water, according to Luby. The vehicle started floating in the estuary before hitting a boat at a nearby dock. The vehicle then overturned and started to sink. Dive teams called to the scene eventually jumped into the water and found the vehicle at a depth of about 30 feet, Luby said. The man was pulled from the water around 10:20 a.m., and crews tried to revive him before paramedics took him to the hospital, according to Luby. It is not yet clear how or why the man's vehicle ended up in the water, according to Luby. An investigation is ongoing.